Thank you for the well wishes and prayers. I'm still typing with one finger on the left, and it is still in a splint, but it is getting better, because it doesn't hurt so much. My spouse took some photos of the new backyard landscape. This is the dining area, and maybe we will get a large umbrella someday. The olive tree we planted last year is about six feet in its tall spot now. I've had this wrought iron furniture for years, and it holds up in the heat. This is a desert yard, and it is pretty typical to use rock, boulders, and crushed and decomposed granite. This is the courtyard area down from the fountain. 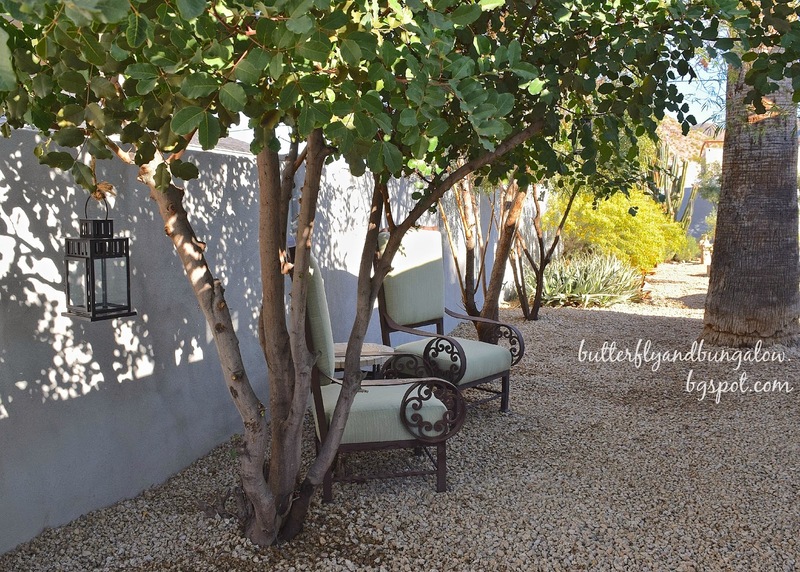 It's a quiet spot in the yard with a fountain and a nice view of the mountains to the left if you are seated. Now all the plants have irrigation lines to control water usage. This is the chiminea area. Our outdoor cats like to nap under those hedges in the daytime. I don't have chairs in this area yet. We kept the older plantings on the left side of the yard. We only lost one tree. :( because it was in front of the door, but we replaced it with a good size tree that in several years will catch up. We have about ten different zones in this backyard, and they are still working on the patio area, so I will have more photos to share. Good to see your post. Your yard is gorgeous. I can only imagine what it will be like this Spring and Summer. Hope your hand is improving. I still look at my beautiful angel wings every day and know John is watching over me. I love them and thank you so much for your precious gift. Five months tomorrow but seems so much longer. xoxo Judy. I think and pray for you often. I LOVE your garden! This is Mediterranean in style to me which is what I prefer. Our home is Mediterranean style and we have surrounded our concrete patio, pathways, potager and grass area with crushed granite. We really like the look of crushed granite or rock. Your patio furniture is lovely. We have tried so many sets that never hold up to the weather. We have dry climate too, though not as dry as you, here in Northern California. We are able to have redwoods which provide beautiful amounts of shade and privacy. Your husband takes wonderful photos and I am so glad to hear you are on the mend. Gorgeous! I must have missed post about your injury. Glad u r feeling better! So pretty. It's fun to see pictures where the ground isn't covered in snow or ice. We are getting dumped on again. But soon it will be spring. Your yard is just beautiful. Glad your fingers are getting better. Thank you, Debby. It is so different from where you are! thank you, Diana. xoxo They do radiate heat, but dust is bad due to Valley Fever, and grass is so difficult to grow depending on location and soil. The light color is a good choice and it used more often in the older parts of town. It some newer areas they use a bit darker granite and it feels hotter. Thank you, Anne. So much work, but grateful to let someone else do the second stage. My spouse did the front, but this is so big and it needed to be regraded besides 24 tons of granite. Lawns don't do well here, and they are planted in patches. We tried to do a patch last year, but our soil is not the right type even though we brought dirt in. If we lived where they have reclaimed flood irrigation it results in an amazing green yard. Would not know it is desert. Glad you're healing. Your olive tree looks gorgeous as does your table area which beckons a leisurely meal with laughter and much conversation. Your outdoors is so beautiful and hubby took great photos. Thank you, Vera. I love Olive trees. They twist and grow multi-trunked, and have such a soft sage color. It is a slow grower, but over the years it will grow over that area! We can't wait to have a party. I love your garden, Su! It's so different from mine. Well, we still have some snow left (half a meter...) Happy Thursday! Your garden is amazing. The chairs are fantastic. Wow!!! The entire area looks inviting and elegant! Great. Oh, not amused to read about your fingers. Hope you'll be better soon! Thank you, Elisabeth. They are on the mend, but still braced for at least a few more days. Thank you, we really started with a lot of mess. I should look for some photos, but I couldn't bear it most of the time. Thank you, Beatrice, we were going for a European look, because our house is not one of the southwest's styles; too much cacti doesn't look right with this type of home, yet it has to be low water. So we have citrus, olive, and some native trees to provide some food and shade in the years to come; we mixed it with the few established plants like 70 foot palms and hedges. Your garden is fabulous. The table and the chairs are very beautiful. I am glad you are not in pain, Su. The yard looks wonderful. Do you guys get to little lizards darting in and out of the yard? They literally are like my biggest fear in life. thank you, Lin. that's how I think about it too ...."rooms"
Oh what a terrible experience I read on your post below. I am so glad you are healing and the fingers weren't broken. You are on the road to recovery - so glad! No more slamming of the hand now! Such a beautiful place! How I'd love to curl up there with a book under the warm sun! Oh Su, what a glorious place to sit and enjoy the day. Your backyard is quite beautiful and it looks so peaceful. On a vacation to Paris, far too many years ago, my sister took me to the Delacroix Museum. I remember loving sitting in the garden on a warm July afternoon. Looking at your lovely garden took me back to that day. Thank you, Carol. That is such a lovely thought... I will have to visit that museum if I go again, because I want to take my daughter, because both of us are art history buffs. (We had so much fun in Italy.) My spouse and I got engaged in Paris in the in the Garden of the Chateau de Bagatelle. Glad to hear that your hand is on the mend. I am really enjoying your garden posts! 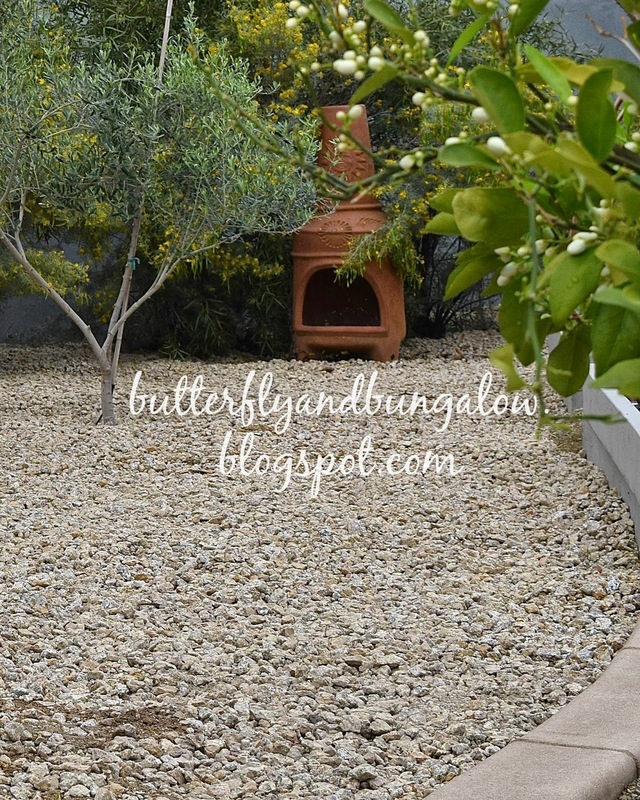 I love that crushed granite, do you get weeds coming up through it or is it fairly low maintenance? It looks so nice, neat, and tidy. Take care, hope you have full use of your hand again soon. Thank you, Judith. It is fairly low maintenance. We have to do a pre-emergent every fall. My spouse kills the weeds when he sees them. The nuisance is mainly bermuda grass. It's invasive , and a couple of times of year we will also have to call in a specialist. We don't have a problem with the front for some reason. To maintain it you brush it around with a wide floor broom. I don't know the name, but maintenance people use them. I might have a strange question, but do you any snakes or spiders in the yard? It looks so nice and tidy. I really love it!! And I am enjoying learning about a Desert Garden, it is fun for me. Knock on wood... we have not had any snakes. In the city there has not been any rattlers for years, but they are in the mountain preserves and the newly built annexed areas. There are scorpions, but I have not seen one since moving to the city. Black widows are plentiful, because they live in walls cracks and tight dark spaces. Where we use to live we had rattle snakes, scorpions, bobcats, mountain lions, coyotes, and a couple of times we saw a coati. Love seeing your beautiful and serene yard. Gorgeous. So happy you are doing a little better since your injury. Glad the hubby can help. Have a great evening. He is really helpful like your spouse. We are lucky. I think of it that way, because it is a good size lot with a small house. Wow I love your pretty yard Su and I bet you love gardening. The chairs are a pretty color and the cat is so cute. Take care and have a nice Friday and weekend. You a pretty good post with one finger, and your spouse took some good photos for you. It's so nice to see a yard with no snow, our has over a foot of snow over it, and I can't wait to see green. Glad you don't have snakes....Hope you hand is better soon! Wow, that must be a good sized yard to have ten different areas in the backyard. And what you have completed looks really beautiful and sophisticated. 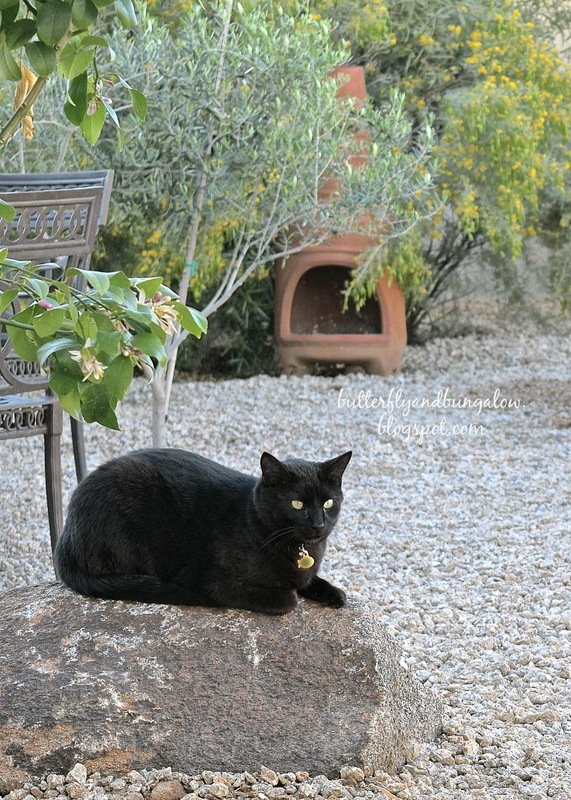 Your cat looks at home in the garden too. I'm glad you are feeling better. Take care. It's a small home on a big lot. I think of it that way, because it has made it easier to figure out what to do with it, however some of the trees will take some years to fill in. Your yard looks like a lovely spot to relax, Su. You'll have lots of shade when your trees mature! Our growing season is so short that irrigation systems aren't necessary and we don't have many hot days either. I hope spring comes soon so I can start puttering in our back yard, too! T.y. Vickie. I will eventually have shade! You are right. A couple of the trees I picked trees for the barren side of the yard that grow fast and will provide some in about five years. The olive and the live southern oak are slow growers, but beautiful as they age. It's amazing that there is so much rain that no drip is needed! It looks beautiful! (this is coming from someone that's not normally a fan of the landscaping down there lol) It actually looks more like something you'd see around an Italian Villa. Thank you, Rue. I took it as a compliment. Oh so in love with your Yard, the feeling i get from it is so French. 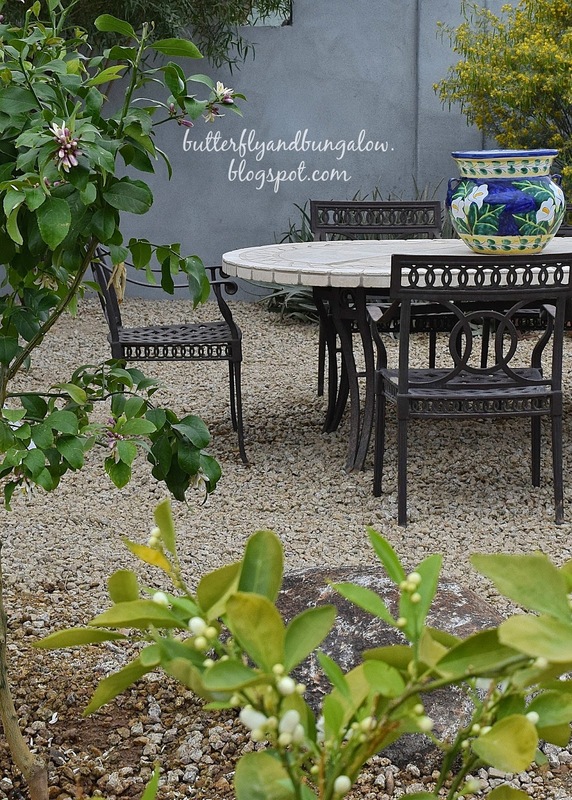 The south of France with its trees, the wall with its shade of blue, the patio table mix of tile and iron, it really feels european here in your backyard .... I have been rocking areas of my yard and doing planter boxes for plantings, planted some pine trees across the back for a wind break and privacy, we here on the Southern California Desert deal with the heat like you and the cold of winter. Rock scaping is the best for our desert climate. See you soon, nice to hear your doing better, and the pictures invite us in to relax in your yard with you. Hi Su! Your backyard is really beautiful! A perfect place to be with friends and relax. I would like to see the other areas soon. Thank you, Nanda. The cats love it. We took the protectors off the chairs, then I went into the house to get something. When I got back outside, each one had taken one sling chair. 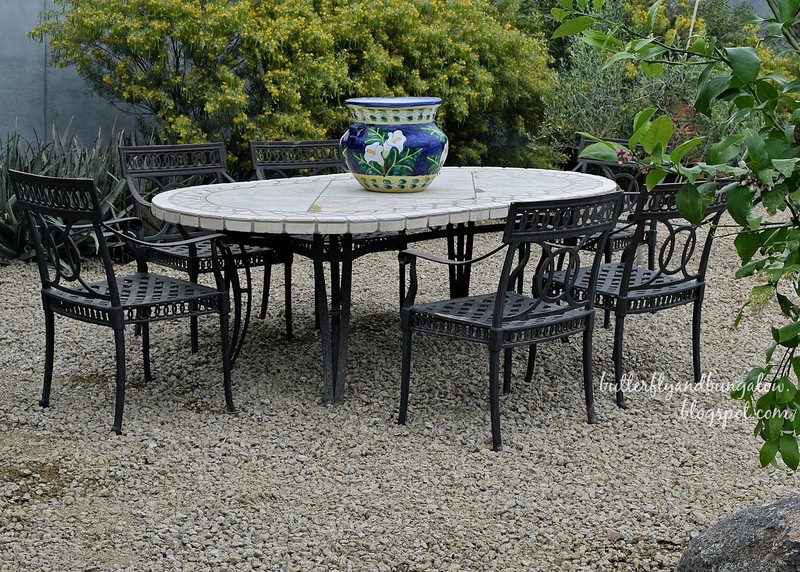 I always think pebble patio areas are serenely elegant. And you can't begin to know how good these pictures look to someone who has only seen ice and snow for 3 weeks now. I think your cat is our Sami Gayle's long lost twin! Thank you. He's pretty good. He mostly stays in the yard guarding his food and water. They were all rescued from a stray. 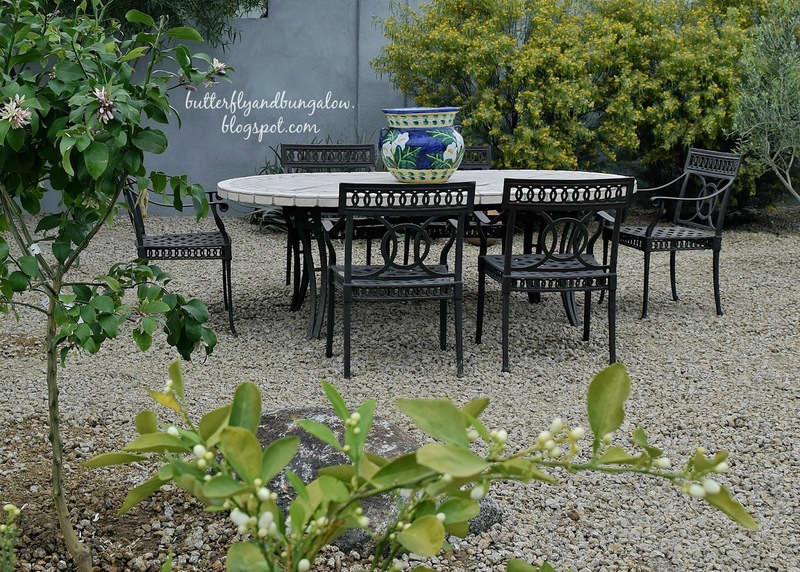 Your garden looks wondeful and the chairs in the shade are so inviting! Thank you, Magali. Shade is so needed and hard to find here. I am happy that we had some older trees to work with on one side of the yard. We planted six citrus that grow slowly, but eventually will provide shade and screen to the patio. We also planted two faster growing natives that should provide some shade in about five years. I had these species before and they were about thirty feet tall when we moved. So glad to hear your fingers are on the mend. Your garden is looking great, I love that you have all those different areas, making it interesting. Love the spot under the trees with the two comfy chairs and the lantern. I can imagine it's lovely at night. It's so interesting for me to see your dessert garden. It's so different from my Irish one which still looks horrendous right now but perhaps I'll show you later in the year. I love lush green gardens, but they don't grow here. Last summer, my daughter and I stopped in Dublin, Ireland twice, once going and on our way back from Europe to Boston. It was so green, and both times it was raining. Though we never left the airport, the people seemed very friendly. We went to the shops. Oh, I would love to be in your spot right now. Tired of the snow & the cold here, but it should mostly melt this week & just be plain muddy ugly. You have a beautiful yard & gorgeous landscaping & thank you for sharing it with us, especially in your condition. Thank you, Robin, we are happy with the garden.